In the sandboxed world of iOS development sharing data between applications can prove difficult. There are a number of reasons you may want your application to share data with other applications. UIDocumentInteractionController — Allows the user to open a document in any other application that registers as being able to handle a particular document Uniform Type Identifier (UTI). The UIDocumentInteractionController has been used in the past as a means of opening a document in other applications on the device, for example, opening email attachments from the Mail app. Unfortunately, the UIDocumentInteractionController‘s UI displays only six applications. You cannot guarantee that your application will appear in the list. While the UIDocumentInteractionController has not been deprecated, the UIActivityViewController provides a more flexible replacement as of iOS 6.0. Allows sharing of common data types with a wide array of applications. Allows control of the type of data sent to the UIDocumentInteractionController, but not the destinations. Limited number of data destinations may cause your application not to display in the list. UIActivityViewController — Allows the user to perform a number of actions with an array of data. 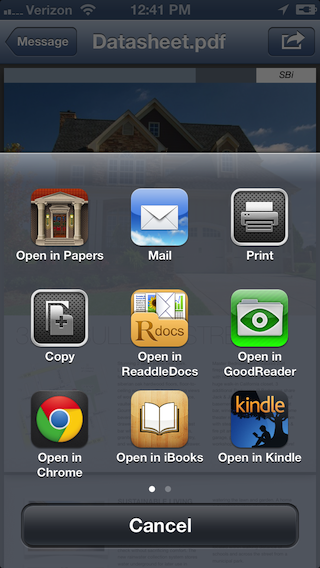 For example they may print, email, copy, post to social media, or open in another application. You may create your own UIActivity subclasses to provide custom services to the user. Great for sharing common data types with a wide array of applications and social media. Can supply an array of items for application to an activity. Objects should conform to UIActivityItemSource protocol. Has the ability to set excluded activity types. Paging UI allows for more data destinations than UIDocumentInteractionController. You must define a custom activity type to restrict “Open In…” destinations of common data types. Shared Keychain Access — Allows you to securely store data to a shared keychain that other applications that are part of a suite of applications can access. All applications that share keychain access must use the same app ID prefix. For an example of shared keychain access in action. See Apple’s GenericKeychain sample code. You can only share data between applications that share a common app ID prefix. The Keychain API on the iOS Simulator comes from OS X, which has different API than that of the iOS device. Custom URL Scheme — Allows data to pass between applications using simple URLs. Great for small amounts of data that you can easily encode into an escaped, legal URL. You must encode data into an escaped legal URL. > Note: base64 encoding has seen common use turning serializable data into a string value. However, base64 strings may include characters that are invalid for use in URLs. You might consider using base64url. See Base 64 Encoding with URL and Filename Safe Alphabet for more information. Web Service – Sync data through third party (e.g. Dropbox) or custom built web service. Useful for sharing and otherwise distributing large amounts of data. One of the above solutions above may prove a great fit for your application, but they all leave room for another potential solution. What if you wanted tighter control over where the data goes and needed to do so while offline? 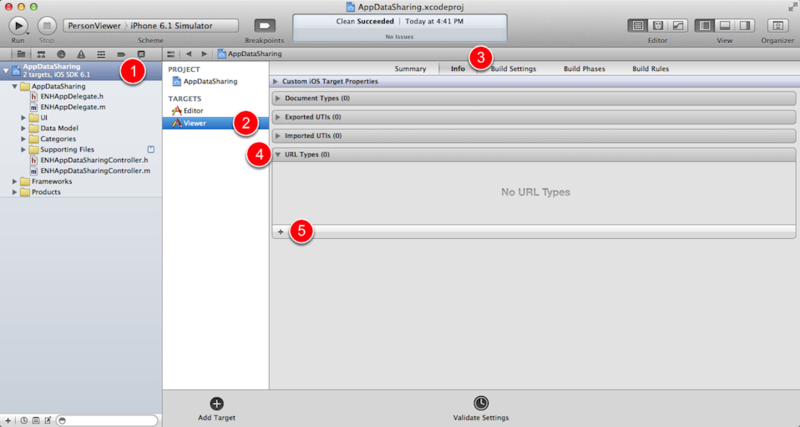 You can accomplish these goals by combining custom URL schemes with a private UIPasteboard. UIPasteboard + URL Scheme – Share data locally on the device between installed applications. Availability: iOS 3.0+. Note: This article takes advantage of API from iOS 4.2+. Limit sharing to a small number of applications. Share data programmatically with minimal user interaction. Specify the destination of the data. Check availability of a specific destination application. Launch destination application from the current app. Flexibility in the size of data shared. Not well suited to open sharing of data. Note: UIActivityViewController may be a better fit if general sharing is needed. General Pasteboard (UIPasteboardNameGeneral) — the general pasteboard is used for generic copy paste operations using all kinds of data. Find Pasteboard (UIPasteboardFind) — the find pasteboard is typically used for search operations. For example, holding the most recent search criteria from a UISearchBar. Custom Pasteboard — a custom pasteboard is intended for use within your own application or family of applications. You can give a custom pasteboard a unique identifier or let the system automatically generate one for you to use. When sharing custom data objects between applications you should avoid using the general pasteboard for a couple reasons. First, when the application moves data to and from the pasteboard, the user is not explicitly initiating copy and paste operations as two distinct actions. Second, the user may have placed data on the general pasteboard for some other purpose. Perhaps they are copying and pasting a person’s name into one app and wants that data to remain on the pasteboard for later use. If the user goes to another application after you have placed data onto the pasteboard you could have inadvertently replaced or wiped out the data they were working with. Looking at the description of the find pasteboard you can see that it just isn’t the right fit for this purpose since as it is reserved for text entered into a UISearchBar. The custom pasteboard is best for the purpose of semi-privately sharing custom data between two applications. Custom pasteboards are identified using unique names. They can persist data beyond the application that creates them, allowing a pasteboard to hold onto data after the application is terminated or even after rebooting the device. When writing or reading data to and from a pasteboard, you must specify a pasteboard type. Pasteboard types typically use a uniform type identifier (UTI) to identify the type of data going into and being retrieved from the pasteboard. See Apple’s UIPasteboard Class Reference documentation for additional information. To illustrate this method of using UIPasteboard to share application data, you will implement custom UIPasteboard and URL schemes in a sample Xcode project called AppDataSharing. The sample project contains two target applications, each running in its own sandbox. The first application target, the Editor allows the user to edit information about a person, such as the person’s first name, last name, and date of birth. 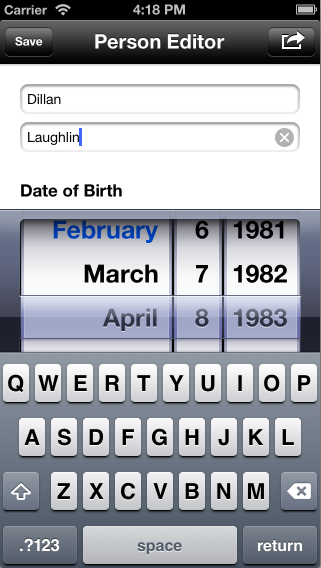 The second application target, the Person Viewer, displays a person’s name and date of birth in a pair of text labels. You can build and run each application by selecting the appropriate Scheme in the toolbar as shown below. URL types tell the system that an application can handle a particular kind of URL. For example, a terminal application might register as being able to handle a URL scheme that begins with ‘ssh’. Applications are free to define almost any arbitrary URL type. In fact, if you have the Facebook app installed on an iOS device you can see it in action by using the fb url scheme. 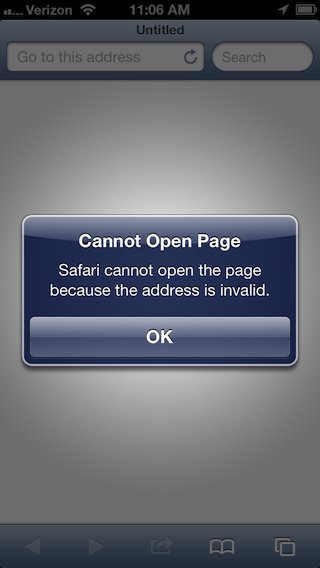 Simply open a Safari browser and enter fb:// into the address bar. You’ll see that the Facebook app launches on the device. See Akosma.com’s list of custom URL schemes for more examples. What happens if an application isn’t installed on the device? You can see what happens using Safari with another URL scheme. This time enter foobar:// in the address bar. If there are no applications on the device registered to handle foobar:// URLs, you will see an error message like the one pictured below. You will define a custom URL type for your application. You will check to see if another application on the device can handle this custom URL type. 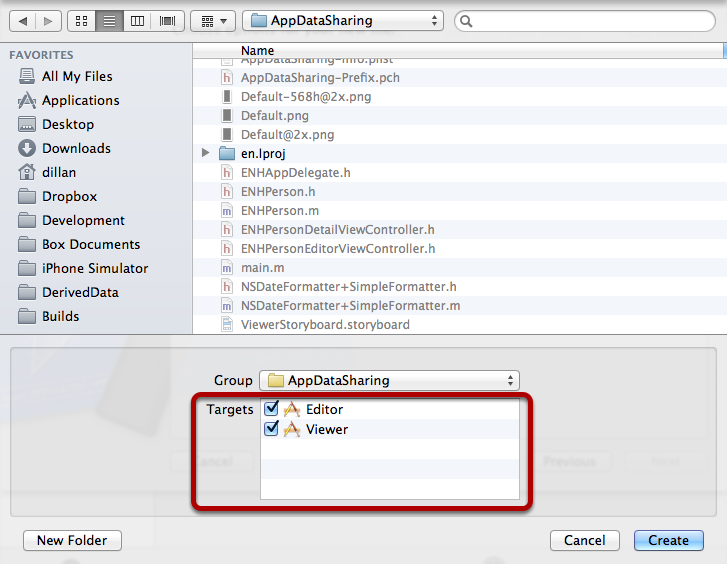 Open the AppDataSharing Xcode project. With the project selected in the source list, navigate to the Person Viewer target. Click the disclosure triangle to expand the URL Types section. Click the + button to add a new URL scheme. Set the identifier attribute to match the target application identifier. In this example you set it to com.EnharmonicHQ.Viewer. Set the URL Schemes attribute to match the target application identifier. In this example you set it to com.EnharmonicHQ.Viewer. > Note: You are free to use almost any string for the URL scheme, but you are using the application identifier in attempt to avoid collisions with other applications that may want to use the same URL Scheme. Make sure you choose a fairly unique scheme to avoid launching the wrong application. Set the Role attribute to Viewer. This tells the system that the application can read and present items associated with the given url type, but cannot manipulate or save them. The URL Type should look like the picture below. Build and run the Person Viewer in the simulator. You can now launch the application from Safari’s address bar by typing this URL: com.EnharmonicHQ.Viewer://. Before attempting to open a given URL, an application can make sure the system can handle the URL. This allows you to present enabled/disabled UI based on availability of another application that can handle the URL. After the Person Editor application has determined that the Person Viewer application is installed on the device and able to handle your custom URL scheme the Person Editor can launch the Person Viewer. In the AppDataSharing Xcode project open ENHPersonEditorViewController.m and add the following line between the #import statements and the class extension to hold the custom URL scheme. We like to use the Bundle ID for this to guarantee uniqueness. Next the Person Editor application will need to launch the Viewer Application. add the following IBAction method. Build and run the Person Editor application. You should see an action button added to the right side of the top navigation bar. If the Person Editor application detects that another app can open com.EnharmonicHQ.Viewer:// URLs the button should enable. Tapping the action button should cause the Person Viewer application to launch. Having the ability to detect the availability of another application and subsequently launch the app represents a great first step. Now its time to get to the meat and potatoes of moving data from the Person Editor to the Person Viewer. The AppDataSharing project has a basic data model for a person in the EHNPerson object. The ENHPerson class has a dataRepresentation method you can use to quickly get an NSData object comprised of the values from the given ENHPerson object. At this point you could simply throw the data representation up onto a general pasteboard and pull the data off of the pasteboard from the Viewer application. This approach could work, but with a few potential pitfalls. What happens as the applications evolve and the data model changes? Is this the only data model object that will need sharing? Is there other binary data (e.g. image data) that needs sharing? Is there other information that you might want to add to help the destination application process the incoming data? You can address these issues and provide a bit of future-proofing by wrapping the data in a container object. In the AppDataSharing project create a new NSObject subclass called ENHAppDataPackage, and add it to both the Person Editor and Person Viewer targets as shown below. The above code declares several properties to hold the application data and associated metadata. All properties are marked as readonly to make sure that packages are initialized only with the designated initializer and that the package contents disallow modification from outside of the class. Next a beefy designated initializer populates all the attributes of the ENHAppDataPackage object. Finally, to make things a little easier we’ve provided a convenience method in the starter project that takes a payload data object and turns it into an NSData object. This code takes all of the properties that were publicly declared as readonly, and redeclares them as readwrite properties for internal use within the class. Uniform type identifiers uniquely identify a particular type of data format. For example, the UTI of a text document is public.text. The public.text UTI is just one of many UTIs that are declared system-wide in iOS. You can see a complete list of common system identifiers in the System-Declared Uniform Type Identifiers documentation. Note: When using system-defined UTIs in your code, you should use the constants defined in UTCoreTypes.h in the MobileCoreServices framework when available, rather than the actual UTI strings. The AppDataSharing project will package the ENHPerson object into an ENHAppDataPackage object. The ENHAppDataPackage doesn’t fit into any of the system defined UTIs, so the ENHAppDataPackage object will need a custom UTI. Open the ENHAppDataPackage.m file and define the UTI just above the static key definitions. Apple recommends that custom UTIs use reverse-DNS notation to ensure name uniqueness between UTIs (for example, com.myCompany.myApp.myType). Since UTIs use reverse-DNS notation, only ASCII characters (A–Z, a–z), the digits 0 through 9, the dot (“.”), and the hyphen (“-”) are allowed. See the Uniform Type Identifiers Overview documentation for additional information. Note: Any illegal character appearing in a UTI string will cause the system to reject it as invalid. Be aware that no errors are generated for invalid UTIs. The AppDataSharing project needs a way to manage the process of moving the data from one app to the next. Here are the steps needed to complete the process. The source application packages the data object for sharing. The source application creates a custom UIPasteboard with a unique identifier. The source application writes package data to the custom UIPasteboard and specifies a UTI for the data. The source application launches the destination application. The destination application finds the custom UIPasteboard. The destination application reads the package data from the custom UIPasteboard. The destination application unpacks the shared data object. The destination application informs interested objects that the shared data object is available. The destination application handles the data. The destination application cleans up the pasteboard data. Add a new NSObject subclass called ENHAppDataSharingController to the project. Add the new class to both the Person Editor and Person Viewer targets. In the above code, a pair of block typedefs outline the completion handlers. The header also sets up a constant data query string and a set of error codes for passing into the completion handlers. The header also declares two class methods. One for sending outbound data packages from the source application and another to handle inbound data in the destination application. Switch to the ENHAppDataSharingController.m file and and add the following above the @implementation. When the source application creates a private pasteboard it will need to have a unique name. You could choose any unique string you wish. This project will allow the system to automatically generate and assign a unique name. There is one hitch in this idea; how does the destination application know which pasteboard name to use when it wants to retrieve the data? The solution is to pass the pasteboard name in the URL used to launch the destination application. This method generates a URL using a scheme, the predefined kReadPasteboardDataQuery string, and the pasteboard name. You can see that the url follows the following format: scheme://?query#fragment. In this string the ‘?’ denotes the start of a query and the ‘#’ marks the beginning of a fragment. This makes it easy to parse the URL in the destination application. You can place the ReadPasteboardData string in the query portion of an NSURL and the pasteboard name into the fragment portion. [pasteboard setPersistent:YES]; // Makes sure the pasteboard lives beyond app termination. This method performs the bulk of the work required to send data to the destination application. First you create a unique pasteboard that will persist beyond the lifetime of the source application. Then, you write the data to the new pasteboard and the system attempts to launch the destination application using your special query URL. If none of the applications installed on the device are capable of opening the URL the method clears out the pasteboard and removes the pasteboard persistence. Finally, the completion handler is called back. Build and run the Person Editor application to load it into the simulator. Next, build and run the Person Viewer application. While the Person Viewer application is running, return to the home screen (Shift-⌘-H) and launch the Person Editor application. Populate the Person Editor UI with a first name, last name, and date of birth. Now, tap the action button in the navigation bar to launch the Person Viewer application. In the Xcode console you will see a log message similar to the one below. This method starts out by asserting that an appropriate URL was provided. It then attempts to find the named private pasteboard and retrieve the package of data. If the system cannot find the pasteboard or if the pasteboard holds no data, an error is generated. Finally the data package (or error) is passed to the completion handler. Also note that when finished with the pasteboard this method cleans up by setting the pasteboard contents to nil. This action method now packages up the ENHPerson object and sends it off to the Person Viewer application. The completion handler then logs whether the package was sent successfully and will log any errors. Build and run the Person Editor application. 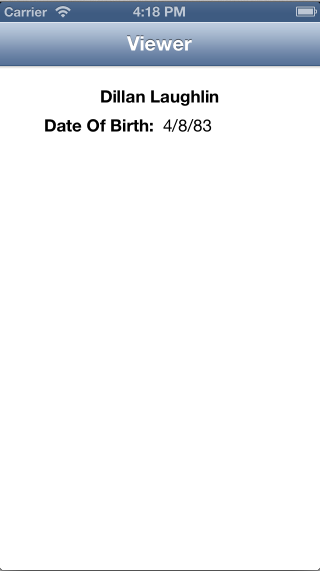 Set the First Name, Last Name, and Date of Birth attributes. Click the action button in the top right. The Person Viewer application should now launch and populate the user interface with data created in the Person Editor. This small change checks that the URL came from an application with a matching prefix to the application identifier. While this is not totally secure, it can prevent unintended behavior in the application. To learn more about securing data read Properly encrypting with AES with CommonCrypto by Rob Napier. Moving data from the Person Editor application to the Person Viewer works well, but what if you launch the Person Viewer without any data to view? Use the same URL handling strategies to allow the Person Viewer to request data from the Person Editor application. Below is an outline of the key steps you will need to address. Add a new URL type and scheme in the Person Editor application target. Create a new query URL that uses the scheme you created for the Person Editor target. In the Person Viewer application check to see if the Person Editor application is installed and is capable of handling the new scheme. Enable UI based on handling capability. The project provided a small amount of future-proofing by sending some metadata along with each data package. This metadata could be used to ensure the Person Viewer is capable of handling the version of the inbound data. Extend the ENHPerson class with your custom attributes, and add appropriate handling code to the Person Viewer. You might also consider adding a payload object classname attribute to the ENHAppDataPackage for additional future-proofing where you might have multiple payload types. Having the device swap back and forth between applications can provide a jarring user experience. Therefore, we strongly recommend that you keep application switching to a minimum. If you find that your own projects need to frequently switch between applications to get the job done, please consider using an alternative solution (e.g. web service, shared keychain access, etc.). Special thanks to Jim Turner for suggesting UIPasteboard as a way to move data and inspiring this article. I’ve lost count of how many beers I owe you by now. This “Tutorial: Sharing Data Locally Between iOS Apps” article is licensed under a Creative Commons Attribution-NonCommercial-NoDerivs 3.0 Unported License. The code in the AppDataSharing sample project is licensed under MIT License. This entry was posted	on Tuesday, May 7th, 2013 at 2:55 am	and is filed under Blog, Development, Tutorial. You can follow any responses to this entry through the RSS 2.0 feed. You can leave a response, or trackback from your own site.